July 16-21, 2018, Poppy Hills Golf Course, Pebble Beach, Calif. The traditional origin of the marathon comes from a story how a herald named Phidippides ran 26 miles from Marathon to Athens to announce a Greek victory. Concord resident Yealimi capped a brilliant performance in what became a marathon of golf. Noh, 16, played 49 holes on Saturday, finally finishing with a 4 and 3 win over 13-year-old Alexa Pano of Florida to win the 70th U.S Girls’ Junior Championship. Noh joins the likes of Pat Hurst (1986), Jamille Jose (1988), Dorothy Delasin (1996) and Lisa Ferrero (2000) as NorCal natives to win the title. Due to the nearly 16 hours of fog delays this week, including 30 minutes before Saturday morning’s Semifinal matches, the USGA came up with a revised schedule on Friday that called for the Semifinals and the first 18 of the scheduled 36-hole championship match to be contested on Saturday, with the final 18 spilling over to Sunday morning. By winning the championship, Noh also earned an exemption into next year’s U.S. Women’s Open at the Country Club of Charleston in South Carolina. She’ll also be invited to play in the USGA’s Day of Champions at the 2019 U.S.Open at Pebble Beach Golf Links. Noh, who won last week’s Girls Junior PGA Championship in Lexington, Ky., with a record-24-under total of 264, recovered from an early 2-down deficit – the first time in six matches she fell behind by more than one hole – by winning three consecutive holes from No. 8 with birdies, two of which were par 5s. She drained a 20-foot uphill putt on No. 8, then reached the 514-yard ninth in two with a 3-hybrid from 240 yards, and adroitly two-putted for birdie. She was forced to lay up on the par-5 10th after a poor drive, but she knocked her third shot to 13 feet, which she converted. 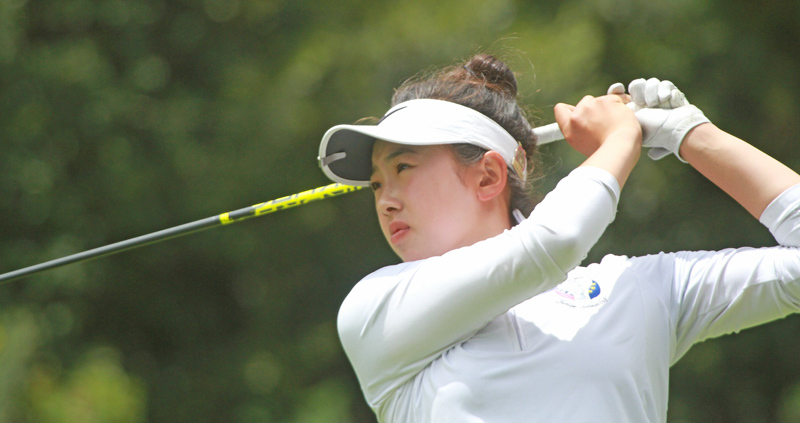 The hoped-for NorCal Dream Match, pitting Lucy Li, of Redwood Shores, against Yealimi Noh, of Concord, in the championship match of the 2018 USGA U.S. Girls’ Junior, did not come about. Li fell to Alexa Pano of Lake Worth, Florida 1-up. Northern California is still in the game, however, as Noh prevailed over Gina Kim, of Chapel Hill, North Carolina, 3 and 2, to advance to the championship match. The Li-Pano match was a hard-fought, fast-moving battle that saw the lead change three times. Pano, whose previous matches only got past the 15th hole once, and ended at the 13th twice, was drawn all the way to 18 by Li, who nevertheless was not able to come up with the characteristic late charge that fueled her earlier wins. In the end, it came down to two birdie putts on 18 – Pano’s dropped, and Li’s – which she hit while Pano looked away, too nervous to watch – didn’t. The Noh-Kim semi-final saw the Concord teen in control all the way, or at least in the lead. Kim kept it close, closing Noh’s lead from 2-up to 1-up three times, but in the end, Yealimi Noh’s combination of length, control, and perseverance carried her through to a 3 and 2 victory over Gina Kim. A key moment in the match was a clutch par save by Noh at the 14th hole, a 369-yard par 4. Noh found the left-side fairway bunker off the tee, then hit into the far-side right front greenside bunker. After Kim’s birdie putt ran 3 feet past the hole Noh got out of the bunker to 8 feet, and sank the par putt to preserve her 2-up lead with two holes to play. 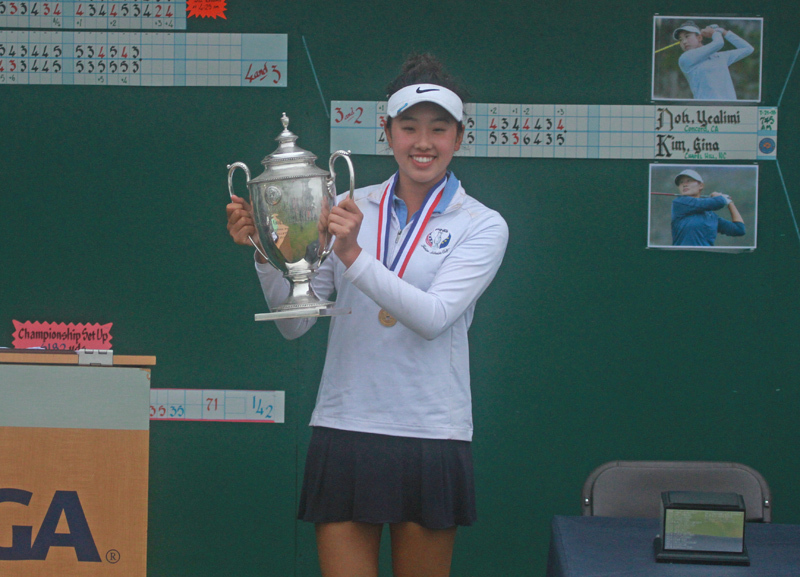 No.1 seed Lucy Li saw her run at the U.S. Girls’ Junior come to an end. No.2 seed Yealimi Noh, meanwhile, is a step closer to the ultimate goal. Li, of Redwood Shores, missed an 8-foot birdie putt on the par-5 18th just moments after No,21 Alexa Pao sank her birdie putt—just slightly longer- to fall victim to an upset loss, 1-up. It was the furthest Li, the No.9 ranked women’s amateur in the world, had ever been in the brackets of a USGA championship. Pano, who at 13 is looking to become the fourth youngest winner of the championship, had twice earlier (on both the 12th and 14th holes) held a 1-up lead Li brought the match back to all-square with a huge win on the 16th hole after Pano’s approach shot stopped on the green but then rolled backwards back into the fairway. One of Li’s next stops will be the U.S Women’s Amateur at The Golf Club of Tennessee (August 6-12). Noh, whose coming off a big win at last week’s PGA Girls’ Junior, marched into the 36-hole finale via a 3 and 2 win over No.6 seed Gina Kim of North Carolina. Noh has not trailed in a match since the Round of 16. In her win over Kim, she’d go 4-under through the 16 holes. . Check out the U.S. Girls’ Junior scoring page for any updates as the day progresses. In what has become somewhat of a race to catch up, over half of the Round of 32 matches were completed by 4 p.m.
No.1 seed Lucy Li of Redwood Shores won her Round of 32 match, 3 and 2, over China’s Jing Wen Lu (No. 33 seed). Li had trailed by two holes through nine but came roaring back. A Li birdie on the par-5 10th cut Lu’s lead to 1-up. Li then went on to win holes No.13 through No.16 in succession, all by making par. In the Round of 16, Li will face No.17 Amari Avery of Riverside. No.2 seed Yealimi Noh of Concord also punched her ticket to the Round of 16, defeating No.34 Calynne Rosholt of Texas, 2 and 1. Noh will next take on No.15 Taylor Roberts of Florida. Mexican national Cory Lopez nearly knocked out No.1 seed Lucy Li in the Round of 64. Lopez, a 16-year-old from Monterrey, took Li to the 18th hole before finally falling, 1-up, when Li made a 7-footer for birdie. A hole earlier on the par-3 17th, Lopez sank an 8-foot birdie to make things all-square. “It was a tough match. I played good. She just played better,” said Lopez, who earned her spot in the championship via a qualifier in Missouri. On Wednesday, Lopez was the last player to get through a 14-for-10 playoff for match play. Not much later she was back at the No.1 tee to take on Li, who entered the event as the No.9 ranked amateur female on the planet. 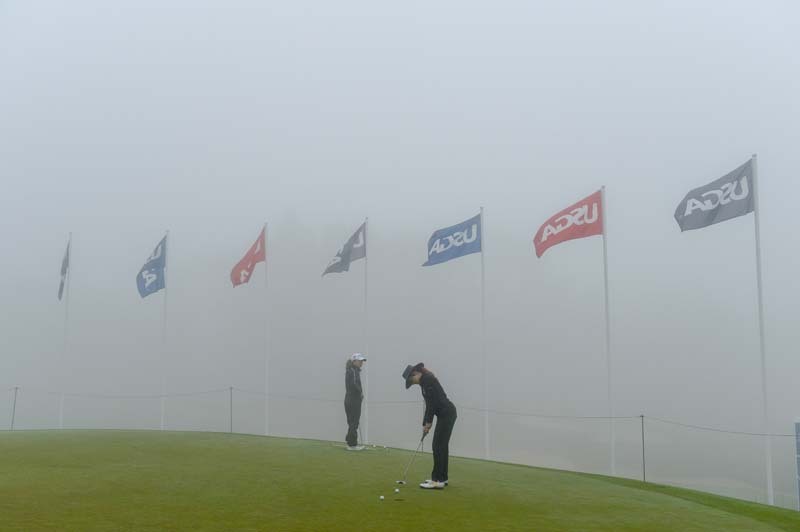 The Round of 64 resumed following another two-hour fog delay in the morning. 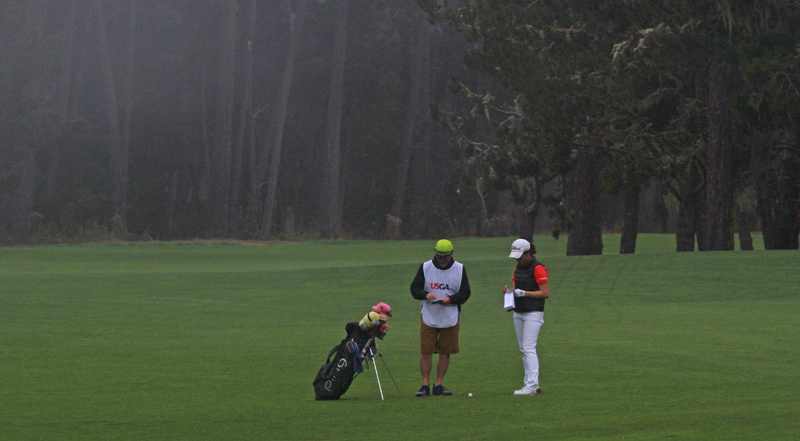 Out on the course, No.1 seed Lucy Li pulled her match against No.64 Cory Lopez back to all-square through 11 holes. When play was called late Wednesday, Li trailed by a hole. No.2 seed Yealimi Noh of Concord, meanwhile, was 2-up through 10 in her match against No.63 seed Ela Ancona of Argentina. Noh was 3-under on her card with three birdies. Madelyn Gamble of Pleasant Hill, the No.40 seed, fell to No.25 Elizabeth Wang, 2 and 1. The two other NorCal players still in the brackets–Katherine Zhui of San Jose and Ashely Shim of San Mateo—were all-square thru nine and 1-up thru two, respectively. Yealimi Noh’s interrupted second round had an odd interlude that got her third day of competition in the 2018 U.S. Girls’ Junior Championship off to a disjointed start. When the horn blew on Tuesday to end play on account of darkness, Noh and playing partner Ashley Gilliam elected to finish the seventh hole, while the third member of their group, Cory Lopez, whose ball was sitting in the rough fringe at the edge of the green after a poor bunker recovery, elected not to finish out. Not only that, but the group behind them elected to play up and putt out rather than mark their ball positions in the fairway. As a result, Noh and Gilliam, and the three players in the following group, all waited on the 8th tee box while Lopez finished up on #7. Noh’s group received a couple of warnings at the checkpoint holes on the course, and had a 15-minute discussion of their pace of play with USGA officials in the scoring tent after their round. The interrupted round, the result of a 4-1/2-hour delay due to foggy conditions, definitely caught Noh wrong-footed. She was 3-under through the first seven holes of the second round, then 2-over for the final 11, for a +1 second round and a final score of 6-under. The score placed her second behind cross-Bay rival Lucy Li, who medaled in the stroke play portion of the tournament with a final score of 11-under 131. 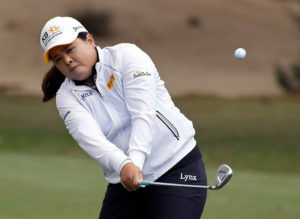 Noh’s game was obviously off in the delayed portion of the second round, which saw her hitting only four fairways in 11 holes, and playing out of waste areas, fairway bunkers and greenside bunkers on five holes – after hitting nothing but fairways and greens in the first seven holes. While half the field, including Lucy Li, spent Wednesday morning resting or sleeping in, the other half was busy trying to complete the second round of stroke play qualifying. As soon as the second round is complete (including any playoffs for the final match play seeds), the championship will move on to the first round of match play. Out on the course, Concord resident Yealimi Noh was still trying to catch Li, who finished stroke play at 11-under 131. Noh was at 7-under through 11 holes. The projected cutline for match play was at 9-over par. NorCal players on the fence included Sienna Lyford (9-over thru 14), Jacqueline Ha (10-over) and Caris Kim (10-over). Early shoo-ins for match play were Li, Noh, Ashely Shim of San Mateo and Madelyn Gamble of Pleasant Hill. While tempestuous weather – wind, rain, once even snow – has often plagued the AT&T Pebble Beach Pro-Am in its January/February time slot over the years, summertime golf events in the Monterey Peninsula region are more often affected by foggy conditions. The Central Coast’s well-known “June Gloom” can range from a high-ceilinged overcast that does no worse than block the sun, to heavy, ground-hugging mist which grounds airline flights, birds, and even golf balls. The latter condition struck on Tuesday, during the second round of the 2018 USGA U.S. Girls’ Junior Championship. A heavy mist obscured the treetops and swirled down to ground level for much of the morning, pushing starting tee times for the second round of stroke play back 3-1/2, then 4, then 4-1/2 hours, with the original 7:00 a.m. start finally getting underway at 11:30. A pair of Bay Area girls occupied the top two spots on the leaderboard after the first round: Lucy Li, 15, of Redwood Shores, and Yealimi Noh, 16, of Concord. Li, who qualified for the U.S. Women’s Open, at age 11, in 2014, started her second round at 1:09 p.m., playing under overcast that changed to broken clouds and partially sunny skies as her round progressed. Noh, who last week won the PGA Junior Girls’ Championship in Lexington, Kentucky, didn’t get her second round underway until 6:35, with no chance of completing 18 holes before darkness stopped play. Li blitzed the field in Monday’s first round with a 9-under 62, tying the low-round record shared by San Jose’s Christina Kim, who shot 62 in the second round of stroke play in the 2001 event at Indian Hills Country Club in Mission Hills, Kansas; and Kimberly Kim, who shot 62 in the first round in 2007 at Tacoma Country and Golf Club in Tacoma, Washington. The diminutive 15-year-old carded nine birdies, nine pars, and no bogeys to lead after 18 holes. Tuesday’s second round was good, but not as strong, for Li. She went out in 35, bracketing a lone bogey, on the par-3 sixth hole, with birdies on holes 4 and 7. Her back nine opened with a pair of birdies before settling into a string of pars that was broken by another bogey – only her second in 34 holes – at the par-4 16th hole. The birdie at 16 dropped Li out of a tie for the all-time USGA amateur scoring record of 130 strokes for 36 holes, which set by Taylore Karle in the 2005 Girls’ Junior at BanBury Golf Club in Boise, Idaho. After a par on 17, Li had a birdie putt on the 18th green to tie the record, but it tailed off to the right, leaving her with a tap-in for par, a final score of 131 – and a strong likelihood of medalist honors. Yealimi Noh, trailing Li by seven strokes going into the second round of stroke play, was warming up for her second round at the time of day when most recreational golfers are heading for the 19th hole to celebrate, or commiserate over their rounds. Teeing off at 6:35, Noh, pushing her own cart and unaccompanied by a caddie, started off as she would like to go on, with birdies on the two opening holes. With the fog lowering to the treetops, the course was so quiet that the sea lions could be heard barking on the rocky shore over a mile away. Noh played from good position in the fairway on every hole, consistently outdriving her playing partners, Ashley Gilliam, of Tennessee, and Cory Lopez, of Mexico. A tough hole position at the par-4 third hole defeated Noh’s run for three straight birdies, but she came back to birdie the first par-5 on the course, #4, sinking a 10-footer from below the hole while the evening mist started to drift through the trees. The birdie brought her score to 8-under for the tournament, three strokes behind the leader in the clubhouse, Lucy Li. A bogey at the par-3 sixth hole, from the left-hand bunker, dropped Noh back to 7-under, but a 250-yard drive and 125-yard approach at the seventh hole – the last her group completed before the horn blew halting play for the day – left her an easy three-foot putt for birdie, and bringing her back to 8-under for the tournament. Play resumes Wednesday morning at 7:00 a.m., when Yealimi Noh and the rest of the afternoon wave will complete stroke play. 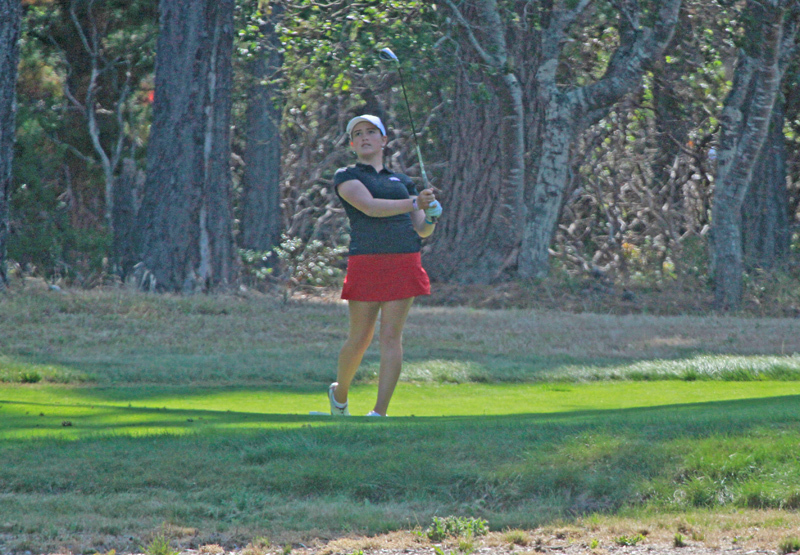 All eyes will be on the 16-year-old from Concord as she makes a run at Lucy Li’s 11-under 131 and the medalist position – and possibly tying or beating the low-round record that Lucy Li just missed equaling today. Trimming the field down to the final 64 may require playoff holes, but after that possibility is taken care of, the field will be seeded and single-elimination match play will begin. The second day of stroke play at the U.S. Girls’ Junior Championship is supposed to be long. With 156 players still in the field, and a nearly guaranteed playoff to see who makes the cut—the anticipation is always high. Today, however, it was a different sort of anticipation. The entirety of the morning wave of players arrived at Poppy Hill with a thick layer of the familiar Monterey Bay summer fog—keeping the eager players on the range instead of on the course. In all, it was over a four-hour delay, settling the debate on whether or not the cut would be made Tuesday evening. With all of the afternoon wave of players still needing to finish their second rounds, there is still a lot of room for movement on the leaderboard—nothing is set in stone. Lucy Li, who was a part of the morning wave, finished her stroke play rounds just one stroke off the all-time U.S. Girls’ Junior Championship 36-hole scoring record with an 11-under-par 131. The only one who can challenge her for the medalist position is Junior Tour of Northern California standout Yealimi Noh of Concord, California. Noh will need a second-round 6-under-par 65 to match Li in the stroke play portion. Most of the eyes at Poppy Hill will be watching a different part of the leaderboard. With dozens of players still within a few strokes of the current cut-line, the field will be eyeing that 64th spot or trying to fight their way through a playoff to make it to match play. After all, the previous 36 holes mean nothing once it’s player versus player. The final round of stroke play will conclude Wednesday morning. Immediately following the field will be cut to the top 64, and the match play bracket will be set. Check out the U.S. Girls’ Junior scoring page for any updates as the day progresses. 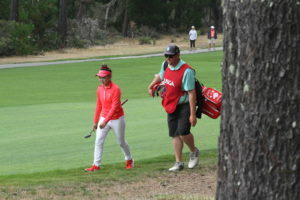 San Mateo resident and Junior Tour of Northern California member Ashely Shim had a bit of an extra hop in her step after coming off the 18th green late Tuesday. 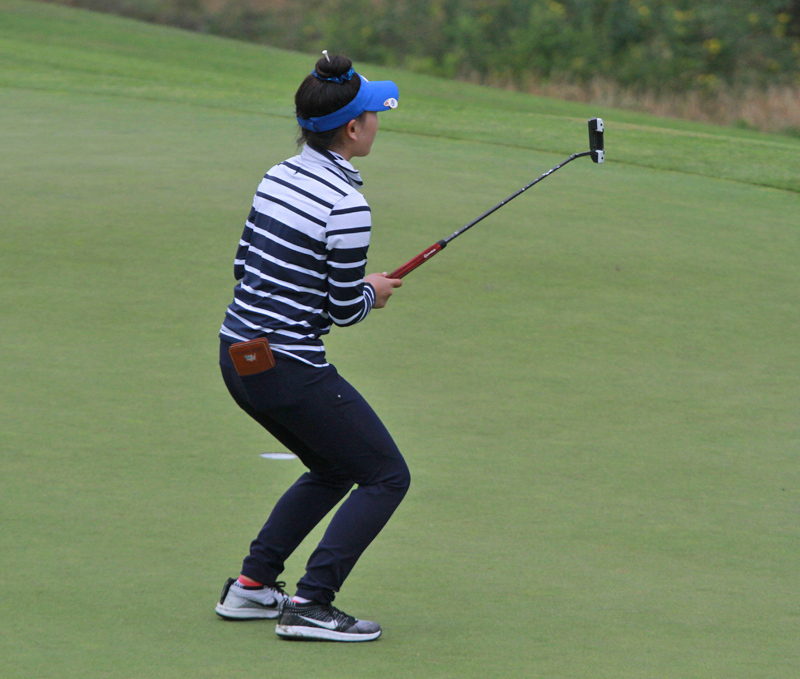 Not only was Shim, 14, a safe bet to make her first U.S. Girls’ Junior cut, but she was set to get some extra rest that could come in handy when match play begins. One of the few to finish her second round, Shim followed up an opening round 72 with an even-par 71, putting her in the clubhouse at 1-over 143 (T-18). The projected cutline, which will come Wednesday morning due to the 4-plus hour fog delay early Tuesday, will probably be around 7-over. Looking ahead, Shim now gets a chance to rest up. The first round of match play won’t start at its original time due to the delay. “The extra time will be mixed. You don’t want to fall out of tournament mode, but then again you can sleep in,” Shim said. No matter the case, the great news is that Shim appears to be moving on. Last year, she missed the stroke play qualifying cut. “I’m having a great week. Everyone is so nice,” Shim said. Make sure to keep an eye on the U.S. Girls’ Junior Championship leaderboard for live scoring throughout the day. When Lucy Li walked in her 15-foot birdie putt on her fifteenth hole (No. 6), it was not because she knew it was going in the hole, it was much more practical. “I walked it in because we were behind on time, so I was trying to hurry up,” said Li after her round. 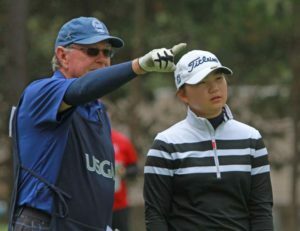 Nevertheless, the 15-year old from Redwood Shores confidently set her own pace on Monday during round one of the U.S Girls’ Junior Championship, opening with a 9-under par 62, which broke the women’s competitive course record at Poppy Hills, and tied the championship record, previously set by Christina Kim in 2001 and Kimberly Kim in 2007. Not to be outdone by fellow Northern California resident Yealimi Noh, who shot a five-under par 66 in the morning wave, Li came out firing with an opening nine of 5-under par 30 starting on the back nine to tie the lead. A near ace on her eleventh hole (No. 2) gave her the lead outright, and she never looked back on her way to a four stroke advantage over the field. “I just played really well today, making everything on the greens, so that felt good,” said Li after her round. Currently ranked number 9 in the Women’s World Amateur Golf Ranking, Li’s opening round included nine birdies and no bogeys, capped off by a 35-foot birdie putt on her seventeenth hole of the day. Li is no stranger to success in the stroke play portion of this championship. In 2017 at Boone Valley Golf Club, she shot rounds of 71-66 to earn medalist honors. Once again, Li feels like her game is in great shape heading into match play. “It would be great to be medalist again, but this is a match play tournament so medalist isn’t the end goal” said Li. The 62 also matches Li’s personal competitive record. She previously shot 62 in the 2017 AJGA Rolex Tournament of Champions, which she went on to win by five strokes. Li tees off in the second round of stroke play Tuesday at 8:39 a.m. Make sure to keep an eye on the U.S. Girls’ Junior Championship leaderboard for live scoring throughout the day. It’s been an eventful couple of weeks for Yealimi Noh, but a first-round 5-under-par 66 at the U.S. Girls’ Junior Championship falls right in line with her latest accomplishment. A little over a week ago, the Concord native showed up at Kearney Hill Golf Links in Lexington, Kentucky, to compete in the Girls Junior PGA Championship. One of the of the bigger events on the national stage, to compete for an automatic berth onto the 2018 U.S. Junior Ryder Cup Team. Even though Noh was in good position to make the team through the points system, she knew she had an opportunity to lock up the spot with four days of solid play. She did not let that opportunity go to waste. She played her first three rounds bogey-free, 66-65-64, to jump out to a 7-shot lead against one of the best fields in junior golf. With enough of a cushion to play the final round more conservative, she finally ceded her lone bogey of the tournament on the back nine, while cruising to a four-shot victory. 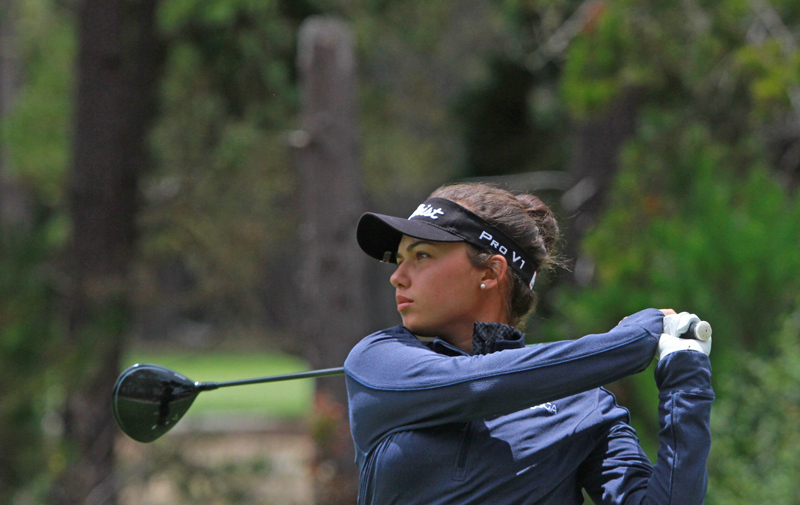 Two days ago, she arrived in Pebble Beach to begin the first of her two practice rounds for the U.S. Girls’ Junior Championship, and today she looked to begin her next big event. Noh didn’t get out to the start she wanted. A notoriously long hitter, Noh started on No. 10—a reachable par 5—but came away with a bogey. She would play the rest of her first round at 5-under par, putting her name at the top of the leaderboard with the second wave of tee times still out on the course. The Junior of Northern California standout has a 2:05 p.m. starting time on Tuesday. Make sure to keep an eye on the U.S. Girls’ Junior Championship leaderboard for live scoring throughout the day. The average age of the 156 U.S. Girls’ Junior competitors is 16 years, 9 months, 19 days. Avery Zweig, 11 years, 5 months, 19 days, of McKinney, Texas, is the championship’s youngest competitor and the youngest qualifier in Girls’ Junior history. She is the only 11-year-old in the field. The championship’s oldest competitor is Elizabeth Caldarelli, of Scottsdale, Ariz. She is 18 years, 10 months and 27 days old as of July 16. There are 14 countries represented in the championship: Argentina (2), Australia (3), Canada (6), Chinese Taipei (2), Colombia (2), Hong Kong China, Japan, Malaysia, Mexico (4), Nigeria, the People’s Republic of China (7), the Philippines (2), the Republic of Korea (2), and the United States (122). There are 33 states represented in the championship: Alabama (2), Arizona (4), Arkansas (2), California (34), Colorado (2), Connecticut (2), Delaware, Florida (10), Georgia (3), Hawaii (2), Idaho, Illinois (2), Indiana (2), Iowa, Louisiana, Maryland (3), Massachusetts, Michigan (2), Minnesota, Missouri, New Jersey (5), New Mexico, New York (5), North Carolina (6), Ohio (4), Oregon, Pennsylvania, South Carolina (2), Tennessee (3), Texas (13), Utah, Washington (2) and Wisconsin. There are two USGA champions in the field: Hailee Cooper, 18, of Montgomery, Texas (2016 U.S. Women’s Amateur Four-Ball with Kaitlyn Papp), and Erica Shepherd, 17, of Greenwood, Ind., the defending U.S. Girls’ Junior champion. Lucy Li, 15, of Redwood Shores, Calif., is the lone player in the field who competed in the 2018 Curtis Cup Match. Li went a combined 3-0-1 in the USA’s 17-3 victory over Great Britain and Ireland in June at Quaker Ridge Golf Club in Scarsdale, N.Y.
No. 70 – Yealimi Noh, 16, of Concord, Calif. They say it’s the tournament that launched the careers of Hall-of-Famers Amy Alcott and Nancy Lopez — and little more than a decade later was the springboard for Northern California’s own Pat Hurst and Dana Dormann. In more recent years, it was the vehicle that first brought prominence to future major winners Inbee Park, Lexi Thompson and Ariya Jutanugarn. And while not a guaranteed ticket to professional stardom, over the years, former winners of the U.S. Girls’ Junior Championship have comprised a litany of some of the LPGA’s best. It has become simply one of the most important events in women’s golf. This month, the Girls’ Junior comes to Poppy Hills, and fittingly, the Honorary Chairperson of the event is Gail Rogers. For the better part of the last three decades Rogers has served as one of the game’s preeminent rules officials and tournament administrators. And next year, she also becomes President of the NCGA. Beginning her career as an elementary school teacher, Rogers has been educating people in the golf world ever since she first started volunteering. She tells of the WGNAC luncheon where she first encountered a decisions book. “I thought, this makes sense to me — it’s case law, I get this,” she recalls. “It was exciting to read a question, look at the footnotes, and figure out why.” By the time she became President of the WGNAC, she had scored in the 90s on the USGA’s Rules test, and was asked to join the Senior Women’s Amateur Championship committee. She was already working USGA events when recruited to join the NCGA in a paid position, wherein she ultimately became the Director of Education dealing with Rules and Competition. 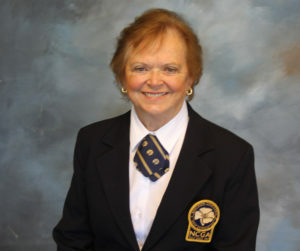 Rogers retired as a staff member of the NCGA in 2008 and subsequently became a board member in 2011, representing her home course, Pasatiempo. 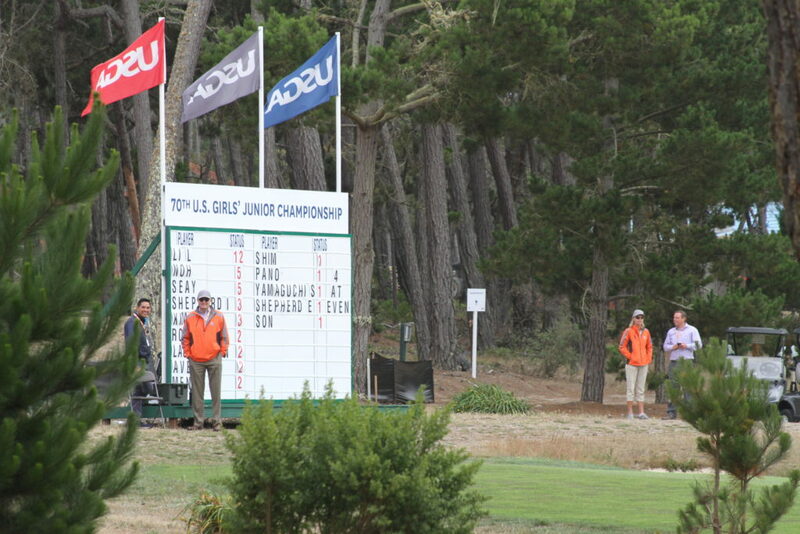 The USGA’s U.S. Girls’ Junior Championship is making a return visit to Northern California this year, at the NCGA’s home course, Poppy Hills Golf Course. This will be the championship’s fifth visit to NCGA territory, and the second time it has been played in the Del Monte Forest. The event was first played in Northern California in 1952, when the 4th U.S. Girls’ Junior was contested on Monterey Peninsula Country Club’s Dunes Course. The tournament returned in 1976, at Del Rio Golf & Country Club in Modesto, again in 1986 at Peach Tree Golf & Country Club in Marysville and most recently the 2012 edition was played at Lake Merced Golf Club in Daly City. 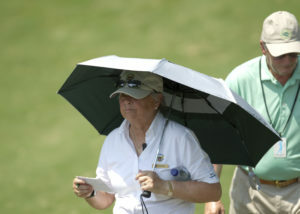 In her championship win, Hurst defeated Adele Moore of Dallas, Texas over 20 holes at Peach Tree G&CC in Marysville. Hurst and Moore later became college golf rivals– Hurst playing three years at San Jose State before turning pro, while Moore played for the Stanford Cardinal. Hurst’s 20-hole win came in the era from 1949 to 2005 when the final match consisted of 18 holes of match play. Hurst co-holds this record with Judy Eller of Tennessee, who defeated Oklahoma’s Beth Stone over 20 holes at Lakewood CC in Denver in 1957. Hurst is one of seven U.S. Girls’ Junior champions who have gone on to win the U.S. Women’s Amateur after becoming U.S. Girls’ Junior champion. She captured that title in 1990 at Canoe Brook CC in New Jersey. The second Northern California winner of the U.S. Girls’ Junior was in the gallery when the first, Pat Hurst, became the champion. 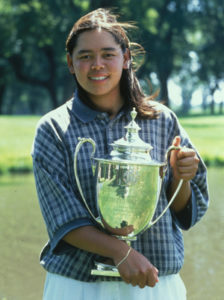 Jamille Jose was just taking up the game of golf in 1986 when her father took her to Peach Tree Golf & Country Club in Marysville for the U.S. Girls’ Junior, where she watched Hurst in her 20-hole victory over Adele Moore. Remarkably, only two years later Jamille hoisted the Glenna Collett-Vare Trophy herself, after defeating Debbie Parks of Carefree, Arizona 5 and 4 at Golden Valley (Minnesota) CC. 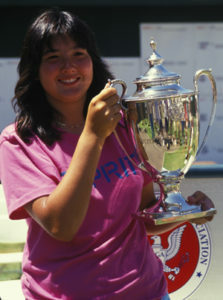 The 1988 victory earned Jamille an exemption into the 1989 U.S. Women’s Open. 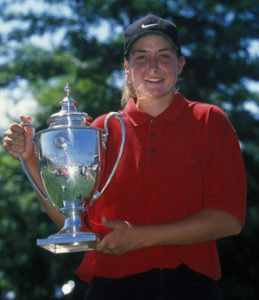 Jose would follow Hurst’s path, winning the 1999 U.S. Women’s Amateur. Born in Lubbock, Texas, Dorothy Delasin grew up in San Francisco, and started playing golf at the age of eight. She shares with Pat Hurst the distinction of having captured the U.S. Women’s Amateur title, in 1999, along with her 1996 U.S. Girls’ Junior title. 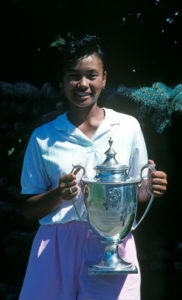 Delasin defeated Grace Park of South Korea, 5 and 4, to take the 1996 title at Westward Ho Country Club in South Dakota. Delasin was also the California Women’s champion in 1996, and was the 1998 medalist in the U.S. Girls’ Junior at Merion GC in Pennsylvania, posting a score of 144 for 36 holes on the venerable club’s East Course. University of Texas, and also played professionally on the LPGA, Symetra and Futures tours. She won the 2011 Symetra Tour Classic and the 2011 Future Tour Teva Championship as a professional, and was the recipient of the distinguished 2014 Heather Farr LPGA Courage Award. In 2017 Ferrero was named to the head coach position for women’s golf at Towson University in Towson, Maryland. 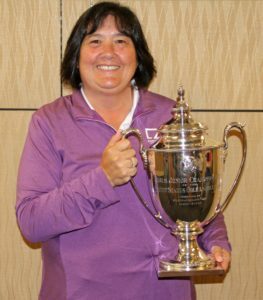 LPGA great and former champion Pat Hurst got reacquainted with the U.S. Girls’ Junior Championship trophy during Preview Day festivities held June 19 at Northern California Golf Association (NCGA) headquarters in Pebble Beach. Hurst, winner of the 1986 U.S. Girls’ Junior, was joined by Northern California junior star Yealimi Noh of Concord as well as NCGA and USGA dignitaries including chairperson Vaughn Kezirian. 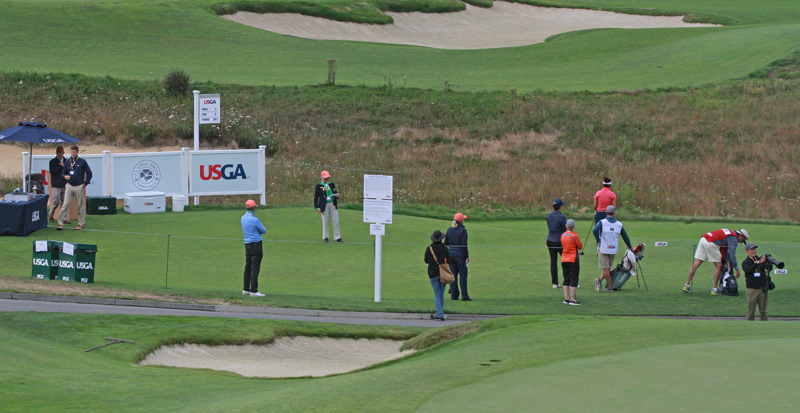 The championship, the first USGA event to be held at Poppy Hills GC, will tee off July 16-21. Admission is free to the public. 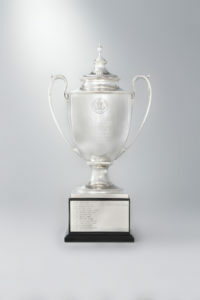 The USGA received a record 1,606 entries for the championship. There are 16 players who are currently exempt, including Lucy Li of Redwood Shores and defending champion Erica Shepherd of Indiana. The 2017 championship featured players from 12 countries and 33 states. There are currently 14 players with Northern California ties who are in the championship field:; Lucy Li, (Redwood Shores), Jasmine Chen (Pleasanton), Maddie Jun,( Mountain View), Kristine Tran, (San Jose), Caris Kim, (Los Altos), Catherine Batang, (South San Francisco), Yealimi Noh, (Concord), Sienna Lyford, (Roseville), Doodle Yuen, (Los Gatos), Sofia Young, (Benicia), Madelyn Gamble, (Pleasant Hill), Alice Liu, (Pleasanton), Katherine Zhu, (San Jose), Nthenya Maithya, (Modesto). While it is making its USGA debut, Poppy Hills GC is no stranger to hosting big championships. The course, which was renovated by architect Robert Trent Jones Jr. in 2014, hosted the AT&T Pebble Beach Pro-Am from 1991-2009 and currently co-hosts the PGA Tour Champions PURE Insurance Open. “We look forward to adding another chapter to Poppy Hills’ legacy,” said John Meyers, USGA Assistant Manager of Competitions. The schedule for the championship proper is as follows: July 16 and 17 (stroke play qualifying), July 18 (first round match play), July 19 (second and third rounds match play), July 20 (quarterfinal and semifinals), July 21 (36-hole championship final). Since reopening, Poppy Hills has become renowned for its firm and fast playing conditions. The course has also become a model for water conservation. “The course is actually only five- years old from seed counting since the renovation. We opened in April 2014. This is a wonderful five-year mark to host this championship on such a young course,” Poppy Hills superintendent Matt Muhlenbruch said. 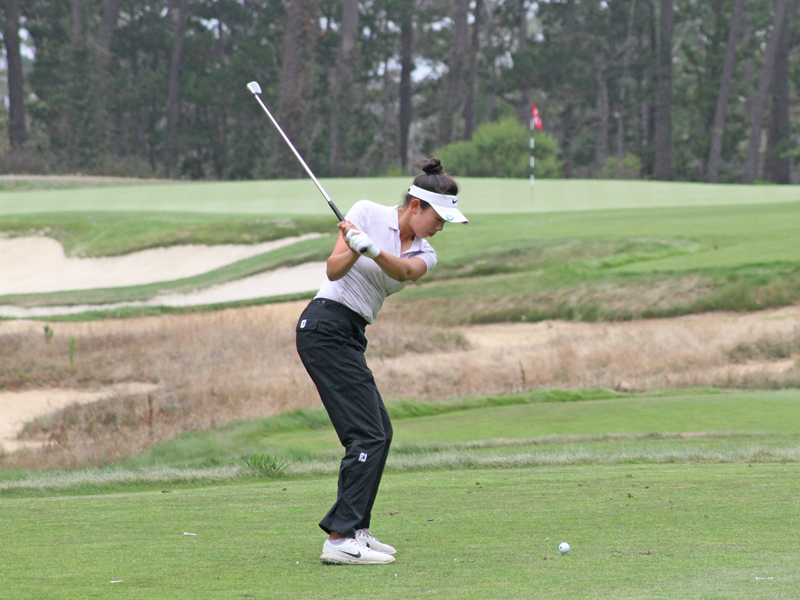 Southern California’s Hailey Borja and Jasmine Chen of Pleasanton are headed to this year’s U.S. Girls’ Junior Championship at Poppy Hills Golf Course. The duo, and four other players, were among those earning automatic spots into the championship proper after advancing through an 18-hole qualifier held Monday at par-72 Corral de Tierra Golf Club in Salinas. Borja and Chen both shot co-medalist earning scores of 1-over 73. Finishing alone in third place at 74 was Maddie Jun of Mountain View. The final three spots went to Kristine Tran of San Jose and Caris Kim of Los Altos (75) and Catherine Batang of South San Francisco (76). This year’s U.S. Girls’ Junior Championship will tee off July 16-21. It marks the first time that Poppy Hills GC has hosted a USGA Championship. 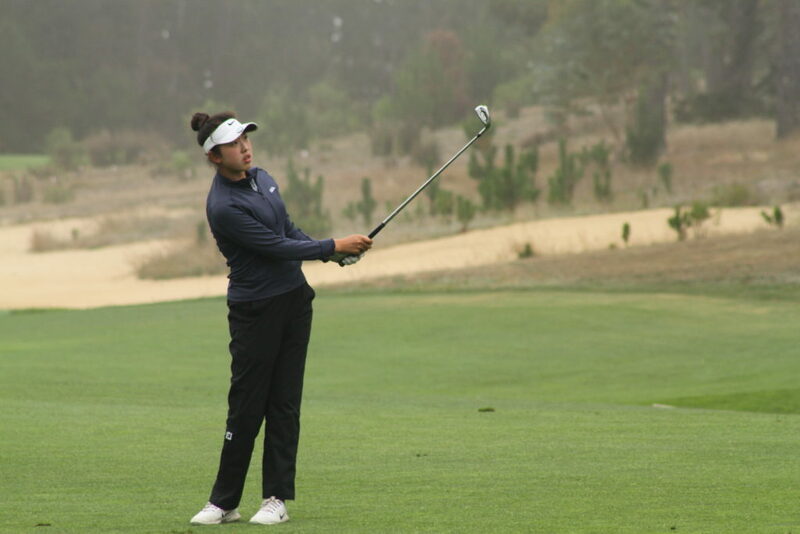 Concord resident Yealimi Noh is on her way to Poppy Hills Golf Course for the 2018 U.S. Girls’ Junior Championship. 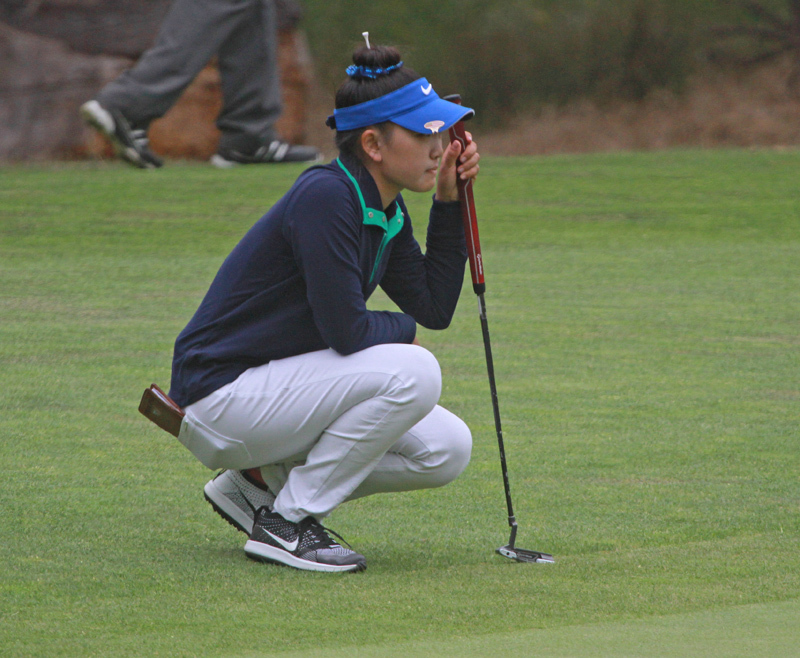 Noh, winner of the 2014 California Junior Girls’ State Championship, shot a medalist-earning 5-under 67 in an 18-hole qualifier held Thursday at par-72 Reserve at Spanos Park in Stockton. Noh carded six birdies with just one bogey. She’d post a 32 on the back-nine. This year’s U.S. Girls’ Junior Championship will tee off July 16-21. Also advancing through the qualifier were Roseville’s Sienna Lyford and Doodle Yuen of Los Gatos, who each shot 70. A total of eight spots were awarded at the Reserve qualifier. Other players moving on were Sofia Young of Benicia (71), Madelyn Gamble of Pleasant Hill and Alice Liu of Pleasanton (72) and Nthenya Maithya of Modesto and Katherine Zhu of San Jose (73). Sectional qualifying for the upcoming U.S. Girls’ Junior Championship is underway. Some of the players headed to Poppy Hills Golf Course, however, don’t have to qualify. Among those who are already exempt is Redwood Shores resident Lucy Li. Li, who last weekend helped the U.S. team to a record win at the Curtis Cup, is exempt under a number of categories including; Making the cut at the 2018 U.S. Women’s Open and being among the Top 75 in the Women’s World Amateur Golf Rankings (No.9). Others who are exempt for the championship, to be held July 16-21, are 2015-2016 winner Eun-Jeong Seong and 2017 champion Erica Shepherd of Indiana. 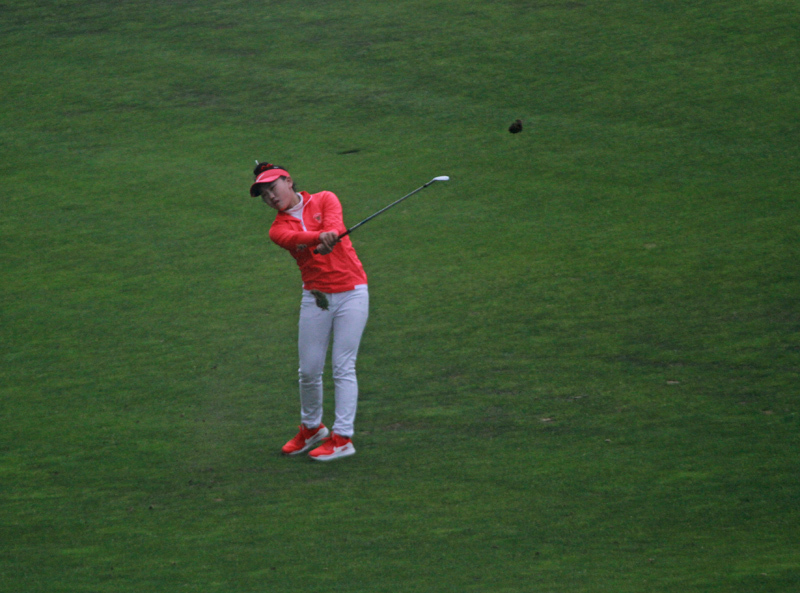 Also exempt is Jennifer Chang, who was the runner-up at last year’s championship. There’s also the semi-finalists from 2016 (Seong and Yujeong Son) and 2017 (Jennifer Chang, Elizabeth Moon, Taylor Roberts, Erica Shepherd). Current World No. 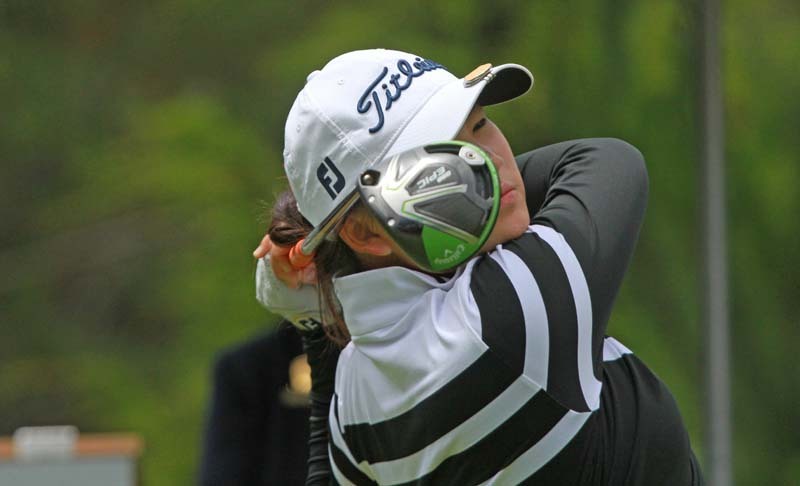 1 Inbee Park has the best record in the U.S. Girls’ Junior Championship among current LPGA players, with a win in 2002, second-place finishes in 2003 and 2005 and medalist honors in 2002, 2003, and 2004. 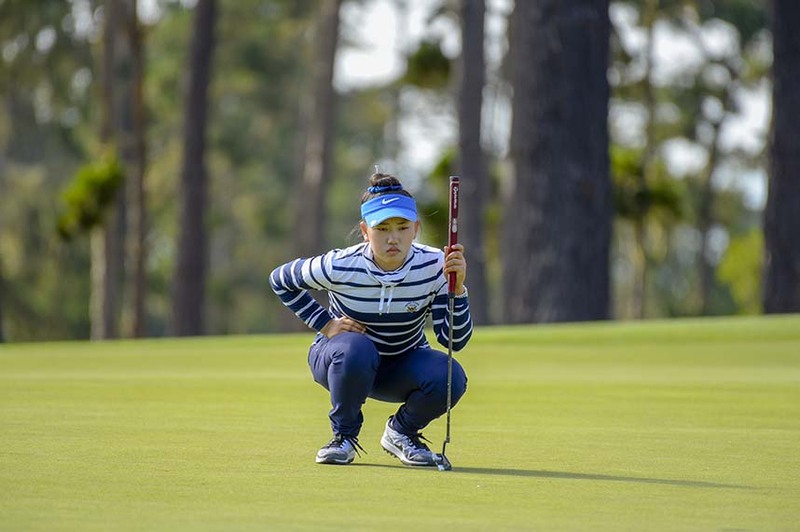 NCGA Golf Magazine spoke to Inbee about her experiences in the U.S. Girls’ Junior during the LPGA Mediheal Championship at Lake Merced Golf Club. Q): You have a very impressive record in the Girls’ Junior. 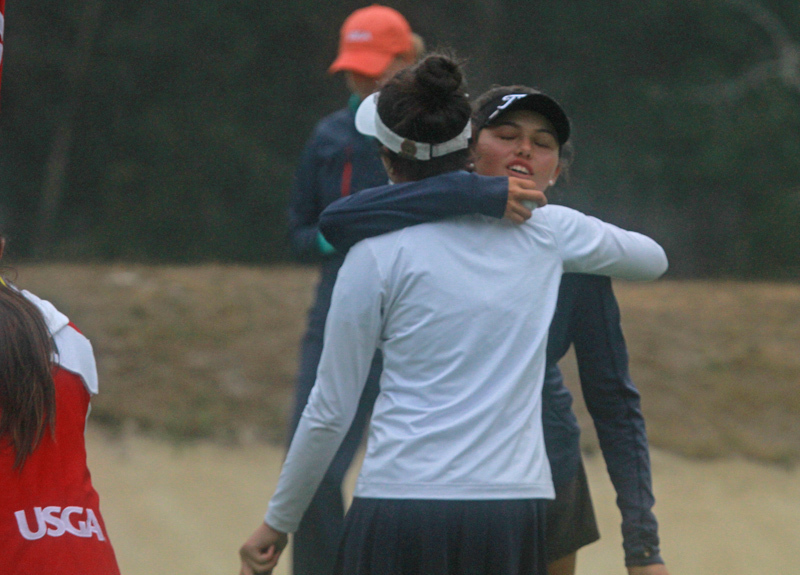 What is your favorite memory of competing in the U.S. Girls’ Junior Championship? Q): How did the event act as a stepping stone for your career? IP: I think we get a lot of good experience playing match play, it’s a little bit different to stroke play, but I think you learn a lot playing match play format. We don’t play that many match play anymore, but it’s the best way to know how to compete, and know the manners, learn the manners. We had a few good match play events when we were growing up, and we played some great golf courses, even though we were such young players. Q): Do you still have friendships on tour that stem from you competing in the U.S. Girls? IP: Pretty much whoever I competed (against) when I was playing the U.S. Girls’ Junior, we still compete out here together – you kind of get the same field, it’s just a different level of playing. 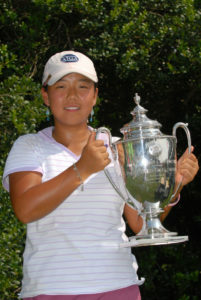 In 2006, 13-year-old Jenny Shin of Torrance won the U.S. Girls’ Junior Championship at Carmel Country Club in North Carolina on the 37th hole. Her opponent, Vicky Hurst, would concede after hitting her approach shot into a water hazard and her ensuing shot into a greenside bunker. At the time, Shin became the second youngest player to ever win the championship. Recently, NCGA Golf Magazine caught up with Shin to revisit her victory. Q): You were the 2006 U.S. Girls’ Junior champion. What is your favorite memory of that week? JS): Probably, just hitting my hybrid great that week. I hit some great shots out of the fairway, hit some great shots on the par-3’s, and I think the funniest part for me was going into a playoff and I thought, ‘Wow, 36 just wasn’t enough, I have to go one more.’ That was really fun.” I had a really fun caddy. His name was James, he was 16 – I think he was a member there. We had a lot of fun; those are fun memories. Q): Even though it was early in your playing days, how did the event act as a stepping stone for your career? JS): I was the underdog, they called it. Everyone thought Vicky (Hurst) was going to win, and for me to just come from nowhere and win that at 13 was a really big accomplishment. It was a really big title for my resume before turning pro. I think it was a big stepping stone for me in ways where I knew what I had to do to win, what I had to accomplish, what I had to keep doing well. Q): Do you still have friendships on tour that you made you competing in the U.S. Girls? JS): Definitely. Vicky’s been kind of on and off (the LPGA Tour), so I didn’t see her too much, but Linda Duncan, she graduated college and she came out on Tour the second year, or third, I think. I had the most fun playing with her at the Girls’. She was an amazing putter, I’ll never forget it, and she still is. I’m still friends with her. I’ve lost contact with some of the players, but I still see them around. Indiana resident and defending champion Erica Shepherd will get a tune-up for this year’s U.S. Girls’ Junior Championship by competing at Shinnecock Hills as part of the USGA’s inaugural Celebration of Champions event. The four-hole exhibition, to be held Tuesday, June 12 of U.S Open week, was formed as a way to honor the winners of every 2017 championship and celebrate their distinguished achievements. That means that the winner of this year’s U.S. Girls’ Junior, slated for July 12-21 at Poppy Hills Golf Course, will get a slot in next year’s Celebration of Champions at Pebble Beach Golf Links as part of the 100th U.S. Open. Eight-time USGA champion Jack Nicklaus will help launch the festivities in what will become an annual tradition. That means that the winner of this year’s U.S. Girls’ Junior, slated for July 12-21 at Poppy Hills Golf Course, will get a slot in next year’s Celebration of Champions at Pebble Beach Golf Links. 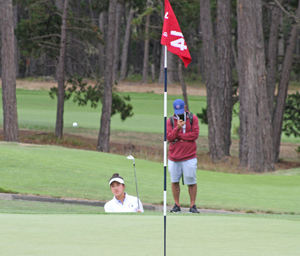 Entries for this year’s U.S. Girls’ Junior Championship at Poppy Hills GC will open on Wednesday, April 4. The championship, to be held July 16-21, is open to players ages 19 (cannot be 19 on or before July 21) and under who have a handicap index of 9.4 or less. The entry fee is $75. Open qualifying for the championship will tentatively take place at 40 sites from June 11-28. The two Northern California sites will be The Reserve at Spanos Park in Stockton (June 14) and Corral de Tierra CC in Salinas (June 18). The event will mark the first time that Poppy Hills GC has hosted a USGA championship. Last year’s title was won by Erica Shepherd of Indiana. The 70th U.S. Girls’ Junior Championship returns to Northern California for the 5th time in its storied history. Poppy Hills Golf Course, home of the Northern California Golf Association has been selected by the United States Golf Association to host the championship. Locate golf balls hit into areas beyond the view of the players by serving as a stationary spotter at a landing area or hazard. This assignment could also include walking up to 18 holes with a group during the match play portion of the competition. Players will arrive on site and go through the registration process from Friday noon, July 13th thru Saturday, July 14th. The process requires a number of stations where volunteers greet and welcome the players, process their information and distribute materials. The Player Hospitality Volunteers will greet the players upon arrival and introduce them to the facility, by providing facility tours. They will chaperone the players’ lounge and insure that the facility experience is exceptional for the players. The Hospitality Volunteers will also act as greeters for the welcome reception. Assist in the process of collecting and managing players score cards and assisting the USGA scoreboard calligrapher in posting the players scores. Duties include overseeing onsite and offsite parking and directing event guests to the appropriate designated parking facility. Drive shuttle vans which will be used to transport players, parents and volunteers from offsite parking to and from the event site. Transportation volunteers will also be responsible for the vehicles designated to facilitate with the golf course evacuation plan. 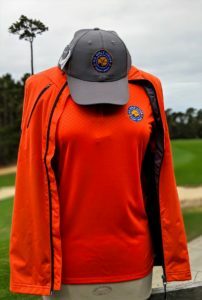 Assist the Poppy Hills Staff in greeting and helping players with golf bags and pull carts at the shuttle drop of area. Assist with onsite hospitality stations on the 1st, 6th , 10th and 15th tees including restocking water coolers, and snacks, checking trash receptacles and maintain the supplies of other materials as needed. Will maintain and stock the driving range with practice ball and also provide transportation to the chipping and putting area near the 9th and 18th fairways. Tend to the player hospitality station at the driving range and make sure the player name standards in the hitting areas are current. Players, spectator or volunteer first aid provider. EMT, nurse or medical practitioner preferred but not required to assist. Assist with the security of the tournament. Background in security and law enforcement is preferred but not required. Caddies are required to highly knowledgeable about golf, with a preference for those who have played Poppy Hills. We will need 30-40 caddies. You must be able to lift 25 lbs., but caddies may request the use of a push cart, if one is not available to them. Players will submit caddie needs approximately one week in advance of the championship. Requests will vary from practice round only to all days of play, depending on how far the player proceeds in the championship. Caddies will provide their availability and be matched to player requests as best as possible. Each player is responsible to pay a daily fee of $80 (price includes gratuity), directly to her caddie. Check all days that apply. Days most need for volunteers are Saturday – Tuesday, July 14, 15, 16, & 17. Preference for later assignments will be given to those volunteering during these most needed days. Please describe any past experience that you have volunteering (working) at a similar event.